Congrats to newly-minted MS, Julia Donaton! Congratulations to Julia Donaton, who successfully defended her Master’s thesis, “Diet analysis of loggerhead sea turtle diet in New York waters”, on November 6! Julia’s presentation discussed her findings on changes to loggerhead diet over a 25-year period, and how diet is linked to broad-scale oceanographic indices such as the Gulf Stream North Wall Index. Following her defense, we had a small gathering in the lab with Julia’s family and friends. Keeping up with the new Thorne Lab tradition, we celebrated with pizza and champagne, as well as a sea turtle-themed ice cream cake. 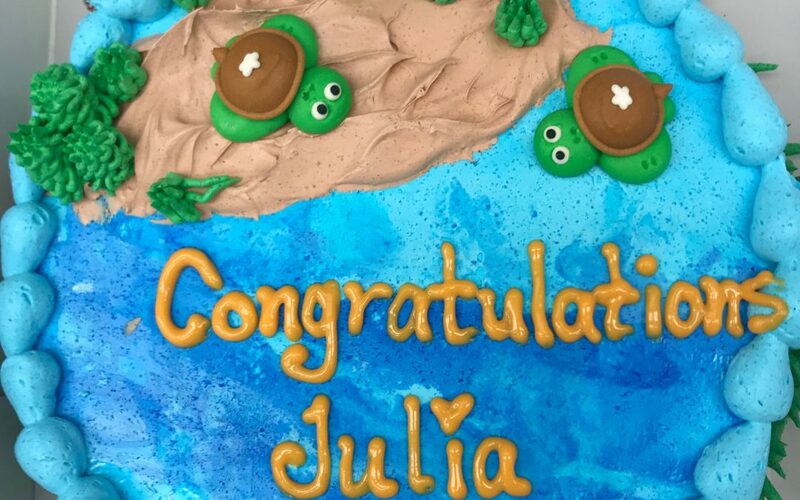 We wish Julia all the best in her upcoming adventures!